Same functionality as Audio Player 1 and 2. This one though is more 'environmentally friendly' - it's not always on 'stand by', you can turn it off! Actually a slightly different size too (339 x 150). Standard Controls - Play, Stop, Pause, Next/Prev Track, Progress/Scrub. Player Size - 339 width x 150 height. 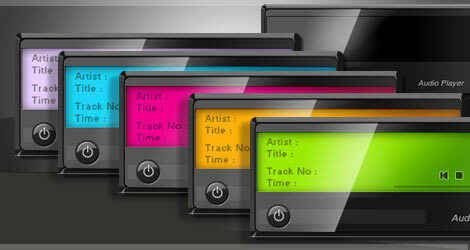 Info - Time Elapsed, Track No., Total Track No., Artist and Track Title. Five Set Colours - Black, Blue, Red (Default), Green or Magenta. Five skin colours to choose from. If you use this MP3 Player on your site, drop us a line, we'd like to have a nosey - enquiries@flashskins.co.uk. Even better, as it would make us tremendously joyful, you could add a link on your site back to ours? *Please Note: The above MP3 Player is free to use for all non-commercial purposes. If in doubt please contact us.